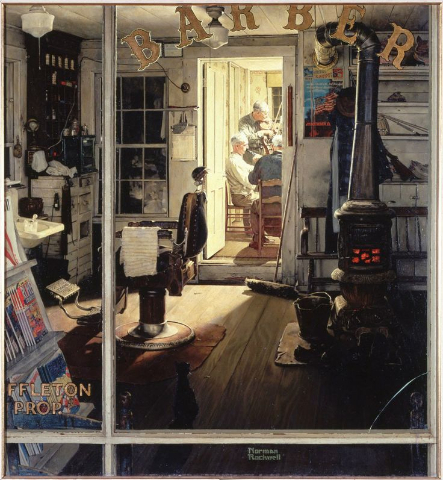 Shuffleton's Barbershop by Rockwell will sold along with 38 other works. Decades before there was a museum in his name Norman Rockwell gifted two works to his Berkshire neighbors. Following a two year study, Van Shields, director of the museum backed by its board, recently announced plans for a $60 million “reboot” of the eclectic, downtown Pittsfield museum which has served and celebrated the diversity of the Berkshires for one hundred plus years. The two Rockwells and 38 other works, which the museum initially refused to reveal, have been assigned to Sotheby’s for a much anticipated fall auction. There is a $50 million estimate on the lot. The museum plans a $20 million renovation as an interactive, primarily youth and student oriented museum with educational displays of science, history and natural history. The $40 million which includes other fundraising will be used to establish an endowment. The news of this extreme makeover was initially greeted with enthusiasm by the community. The focus on interactive, youth oriented science and technology has broad appeal to parents and schools. In letters to the editor mothers exalted about bringing their kids to the museum on a rainy day. Ok, but what about adults on weekends and visitors in high season? As so often is the case when there are cutbacks they come at the cost of the arts. While quirky and eclectic the strength of the museum for the past century has been the manner in which it conflates these elements. Running a deficit and facing struggles moving forward the director and trustees see a windfall in dismantling its extensive fine arts collection starting by cherry picking items of high value. The Association of American Museum Directors has published guidelines for deaccessions. “Deaccessioning is practiced to refine and enhance the quality, use, and character of an institution’s holdings. “The decision to deaccession is made solely to improve the quality, scope, and appropriateness of the collection, and to support the mission and long-term goals of the museum. These guidelines have no legal authority beyond moral and ethical leverage. Museums that do not conform are generally shunned by other museums particularly by declining to loan works for special exhibitions. In response to this deviation from ethical guidelines Shields and his board have an interesting response. Using pressure on the editorial board of the Berkshire Eagle to remove my letter with the above quoted guidelines he stated that he is not a member of AAMD and that the museum is not a fine arts museum. It is, however, a member of AAM. With a slight edit the Eagle ran a revised letter. 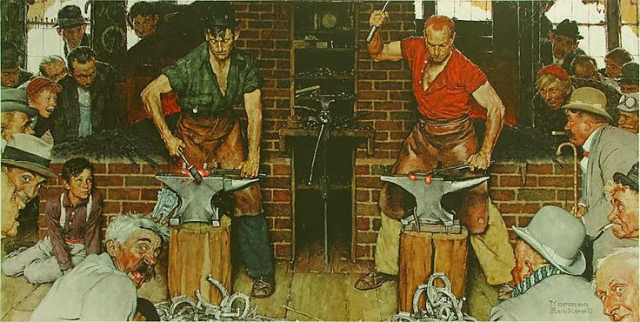 That would come as a surprise to Rockwell and the many artists, past and present, who have participated in exhibitions, gave works directly to the museum, or had them donated by patrons. We have been contacting artists and others actively involved in this activity which in general tapered off under the watch of Shields. Even attempts to donate significant works to the museum met with obstacles. Sources stated that the acquisitions committee rarely if ever met. Through lack of synergy artists and other interested parties disconnected. Ironically, Berkshire artists, for the most part, gave up on the museum before it abandoned them. That may be a factor in the deflation of attendance and increased deficits. The decision to sell works and get out of the art game is seductive in the short term. But moving forward there are issues and questions that beg to be answered. Start with will it work? The museum sees itself as competing with the nearby Norman Rockwell Museum, and not far away the expanded Clark Art Institute, MASS MoCA, Williams College Museum of Art or the relatively new Berkshire Artists Museum. There has been a steady increase of cultural and particularly fine arts tourism. A rising tide raises all ships but the Berkshire Museum has opted out of this synergy. Under the former director, Stuart Chase, often in projects in collaboration with gallerist Leslie Ferrin, there were lively and imaginative exhibitions and acquisitions. Established and emerging artists were involved. An aspect of this is the donation of works by artists like Stephen Hannock and Gregory Crewdson. Their works sell for six figures. In an extensive interview Hannock discussed being included with other major artists in a show this summer at the Shaker Village. This is the result of the vision and energy of the new director, Jennifer Trainor Thompson, who was associated with MASS MoCA since its inception. It’s the vision thing which Berkshire Museum seems to be lacking. Undertaking a thorough inventory of the collection of some 40,000 objects Chase discovered three modernist Russian paintings by Boris Dmitrievich Grigoriev. They did not fit into the mandate of the museum. Largely due to the oligarchs the market for Russian art has soared. They sold for $7 million at Sotheby's on November 3, 2008. The funds were applied to the newly created Florence Keep and Josephine Crane Fund honoring the original donors of the paintings. The deaccession conformed to AAMD guidelines. We contacted Chase at Monterey Museum of Art. By e mail he was gracious but declined to discuss the Berkshire Museum. Chase was also interested in Native American art and artifacts. To study and evaluate its holdings he hired Kathleen Ash-Milby associate curator of contemporary Indigenous art at the National Museum of the American Indian – George Gustav Heye Center, Smithsonian Institution in New York City. Because of the aggressive genocide of indigenous peoples in New England this material, much of it collected a century ago, is rare and valuable. Ferrin told me that she had asked the museum about the current status of the Florence Keep and Josephine Crane Fund. There has been no answer. The strategy of the museum has been to circle the wagons. Today, however, there was an above the fold piece about and an op-ed piece by Laurie Norton Moffatt in the Berkshire Eagle. Reached by phone this afternoon she was reluctant to add to what she stated and is focusing on the Norman Rockwell Museum which she directs. I asked what might be done to keep the Rockwells in the Berkshires but she declined to speculate. She said that it will depend upon others coming forward. I asked if she had heard anything from other art professionals, business or community leaders. There wasn’t a positive response but she commented that her phone was ringing off the hook and that there is fast breaking national coverage. In response to media pressure Shields told an Eagle reporter that the museum soon will release the complete list of 40 works it plans to deaccession. That is likely to cause strong reactions. It has been speculated that the list will include works by Hudson River painters Frederick Church, and Albert Bierstadt. In the era of modernism the Alexander Calder Circus, which has delighted decades of visitors, is likely to be sold. Works by Crewdson and Hannock have value in the secondary market. The $20 million earmarked for renovation entails dramatic changes. The aquarium, long tucked in the basement, will be relocated in the expanded lobby. To make room for it there are questions about the future of the auditorium and its popular Little Cinema programming of art films. In the initial rollout of the sale and its potential, with much fanfare, Shields has basked in the limelight. Now with a shift to national media and tough ethical and fiscal questions that will likely rain on the parade. As Moffatt put it nothing is likely to change unless a lot of other arts leaders step forward. Soon to be lost forever. "Many local artists were introduced to painting at that museum. We ventured forth to the Clark and occasionally to Springfield but we looked forward to the Berkshire Art Association juried shows and the numerous curated exhibitions." "Great Aunt Elise left our relative, Mrs. James Russell painted by John Singleton Copley, to the Boston Museum of Fine Arts, where she saw stored in the basement for years. Some family members were offended when she was deaccessioned. Lawrence A. Fleischman at the Kennedy Galleries was charged with selling her. When I visited, he pulled back floor to ceiling length red velvet curtains, looked at me suspiciously and said, "It takes six generations to make a lady." Mrs. Russell is now prominently displayed at the North Carolina Museum of Art. Maybe she can breathe better in the light of day." "Really wild. There surely will Be an uproar. What are these people doing." "Sounds like the Rose Art Museum fiasco all over again." "The Rose at Brandeis deaccession was reversed so maybe this will be too. "Interactive" is the operative word in the Museum's statement, which MassMoCA a competitor is really good at. I think the new generation is incapable of the appreciative gaze, required to understand painting. Everything is hands on." "Art too is good for kids, as well as butterflies, bugs, stuffed dead animals, an aquarium. And it's good for them to see adults looking at paintings, and direct their gazes there. So even if the Berkshire isn't an art museum, it should be one. Nice work."